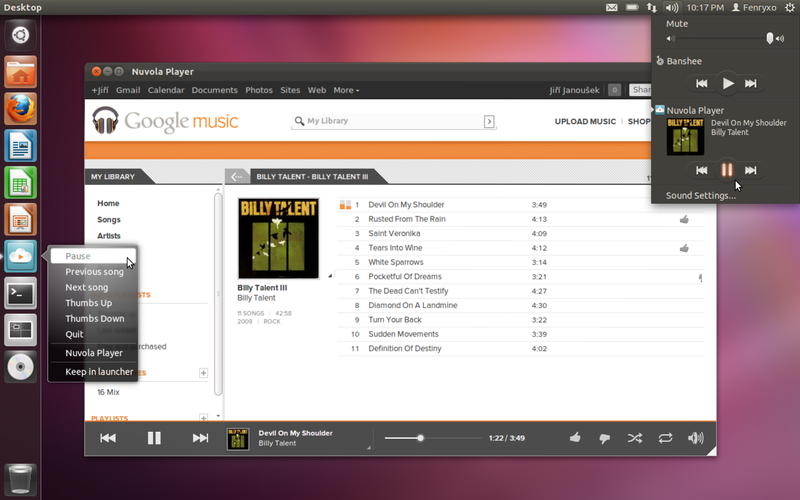 There is no dearth for good quality music players in Ubuntu. Even the default Rhythmbox is pretty darn good. But how many of those music players can be considered as good-looking? It is a tricky question since looks are very subjective. Anyway, here's a collection of 6 best music players for Linux which I think are among the most good looking alternatives out there. Musique Player for Ubuntu: Not the ideal player if you have a large music collection or if you expect a lot of functionality similar to what you see in a music player like Clementine or Banshee, for example. But it looks great, has last.fm scrobbling support, and even though scanning speed leave a lot to be desired, it works. Musique player's info page (see above) is especially nice. Very well put together and does the trick. Download Musique player for Windows, Mac and Linux. If you're using Ubuntu, you can use the following PPA. Nuvola Music Player: It is not a traditional music player per se. Nuvola is meant for people who stream a lot of their music. Currently supported online music services include Amazon Cloud Player, Google Play, Pandora Radio, Deezer, Rdio, Grooveshark, 8tracks, Hype Machine among others. Download instructions for various Linux distros can be found here. If you are an Ubuntu user, you can simply do the following in Terminal instead. 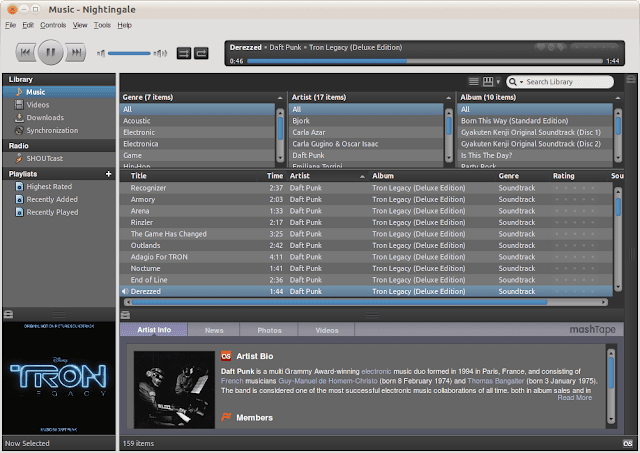 Nightingale Music Player: Years ago, Songbird was one of a kind music player that everybody would recommend to new Linux users. But overtime, the project itself got discontinued. In the open source world though, no project never really dies until their user-base gives it up completely. Songbird got forked. It has now re-incarnated into something even more functional, elegant and visually pleasing alternative, and it is called Nightingale. Clementine Music Player: Speaking of feature-rich music players, Clementine is the one that first comes to my mind. 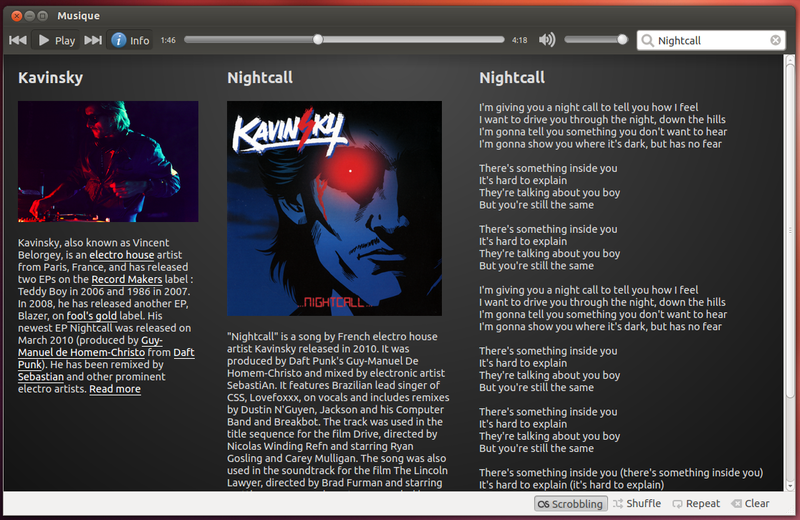 And like Nightingale, it is also a fork, and that too of once's mighty Amarok 1.4, KDE 3.x's default music player. It started slow but gathered pace pretty fast. 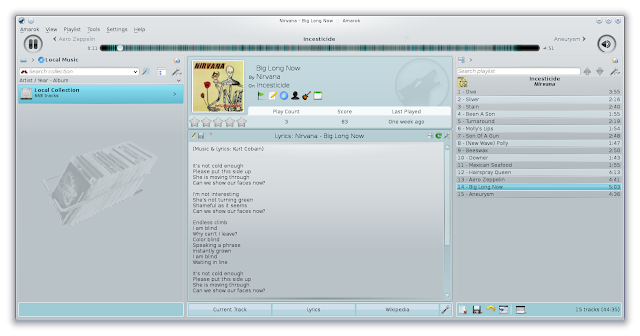 It is perhaps the most comprehensive music player for Linux at the moment, without comprising too much on the looks front either. A must try if you're a music junkie. 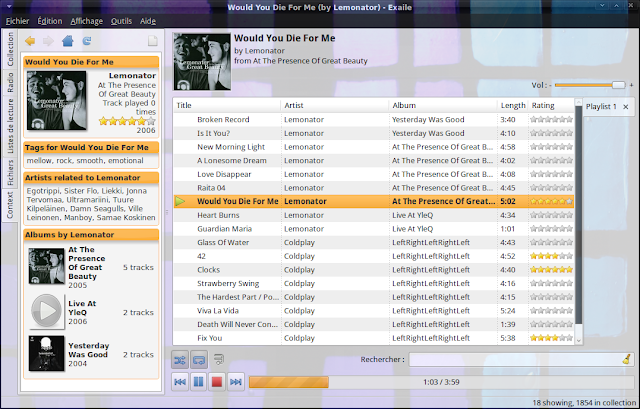 Download Clementine for Windows, Mac and Linux from here. Ubuntu users, just do the following in Terminal. 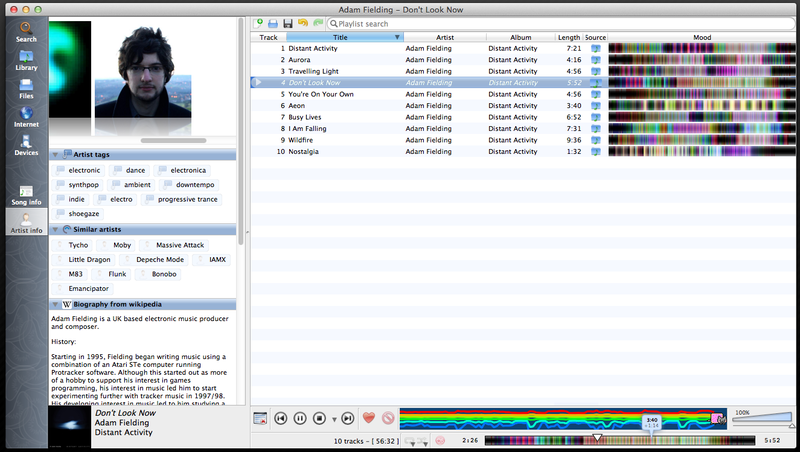 Amarok Music Player: And of course Amarok. It is now the default music player for KDE 4.x. Even though earlier versions of Amarok 2.x series was heavily criticized for breaking the good old Amarok 1.4, it has improved so much since then. Amarok 2.x is now perhaps the perfect compromise between functionality and style. Amarok 2.x looks gorgeous and has so many useful features which will put most other music players to shame. Amarok is available within the default repositories of most Linux distros. See download page if you're not using Ubuntu. And if you're using Ubuntu 12.10 or above, you might want try the latest Amarok version instead. Simply do the following in Terminal. Exaile Music Player: Simplicity has its beauty. Exaile is a testament to that fact. Don't underestimate Exaile from its rather modest looks though, it packs enough punch to meet most user's expectations. Also, like Amarok, Exaile is available within the default repositories of most Linux distributions. See Exaile download page for more info. One other music player I dearly love, and which I have not mentioned here, is DeadBeef. If you're someone who loves to play around with commands and Terminal, a combination of MPD and NCMPC might suit you. And if you are an Android fan like me, here's a collection of coolest music player apps for Android you should check.